What does it mean to be extreme? A radical houseboat design could be extremely futuristic, extremely innovative, even extremely ugly – whatever floats your boat. The rustic & rugged “Redneck Houseboat” above falls into the latter category as do many a generic houseboat. 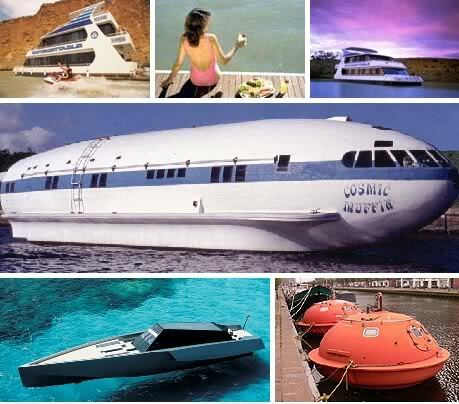 By contrast, the focus here will be on interesting and unusual houseboats for rent, for sale and for houseboat vacations. 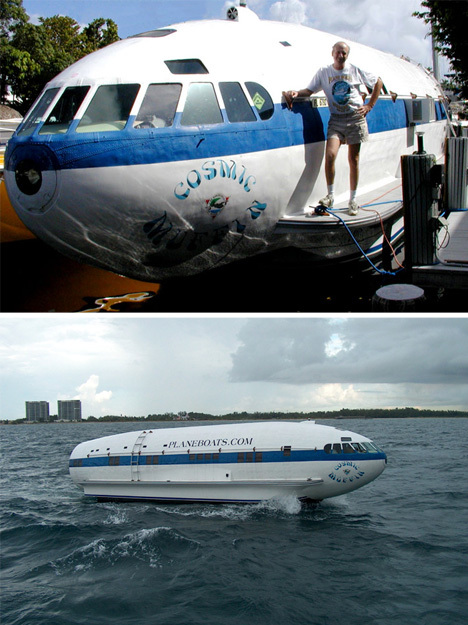 The Cosmic Muffin takes the concept of a seaplane all too literally. Once owned by eccentric aviator extraordinaire Howard Hughes, this unique houseboat was crafted from a 1930s vintage Boeing 307 Stratoliner, the civilian version of the B-17 Flying Fortress. These days it cruises at a much more sedate pace (and lower altitude) and is available for charter houseboat rental. There will always be those who feel the need for speed, even when the vehicle is their home. For this select group, the WallyPower 118 fills the bill. A trio of gas turbine engines propel this amazing, 118-foot long superyacht to 60 knots faster than you can say “We’re not in Kansas anymore, Toto”. Six guests and six crew get to enjoy life at speed at sea, surrounded by beautiful teakwood, titanium and carbon fiber fittings. 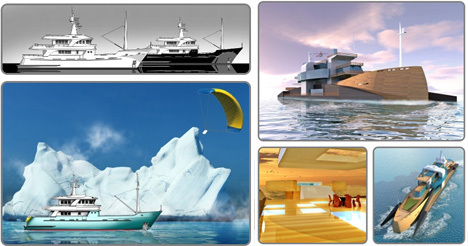 Got close to $25 million to spend? You’ll need that much to call the WallyPower 118 home! If the previous couple of extreme houseboats smack of conspicuous consumption, this next one from Amsterdam is just the opposite. 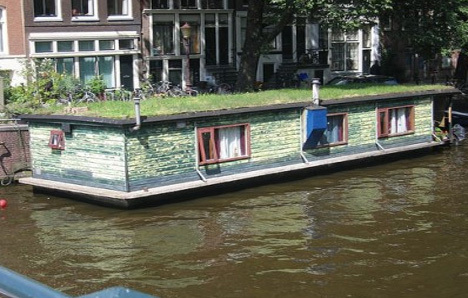 Go green while cruising the Delft-blue waves with a grass-topped boat. 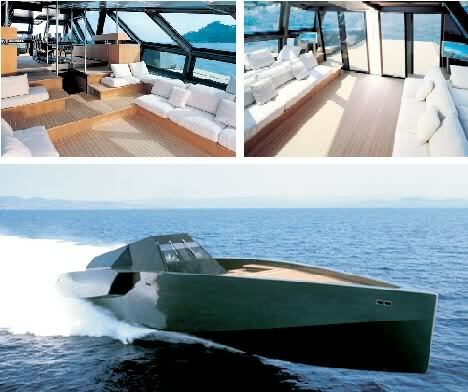 If it were also a glass-bottomed boat, well that would be just perfect! 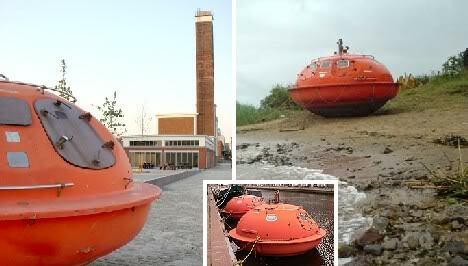 Also from Holland are these unusual floating hotel suites adapted from oil rig survival pods. 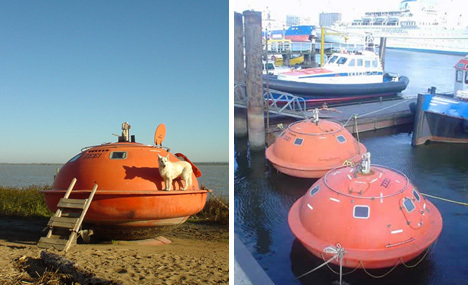 Visitors to The Hague are encouraged to try an undoubtedly unique houseboat experience, “available by prior agreement for special occasions only.” One wonders how any occasion spent inside one of these UFO-esque survival pods could be anything BUT special. Of course, unusual isn’t always the best thing when it comes to practical living on a budget. DIY types who feel the urge for houseboating can procure houseboat plans online, often for under $100, from companies like LiteBoats. The 16-foot and 18-foot houseboats depicted above are a good starting point for those who want to dip their toes into the houseboating lifestyle. 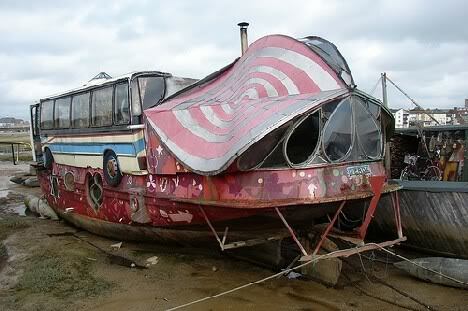 From that point on, extreme houseboat living is only a wave away. Continuing on that train of thought, HGTV recently featured the Railroad Houseboat shown above as one of their Extreme Homes. Among the more than 500 houseboats of various shapes, sizes and styles clustered off the coast of Sausalito CA, the Railroad Houseboat really goes off the rails design-wise. The owners of the 2,000-square-foot home managed to transform a 19th century Pullman car into a floating wonder while carefully preserving and re-working as much of the original accoutrements as possible. History of a different flavor awaits tourists visiting the Indian state of Kerala. 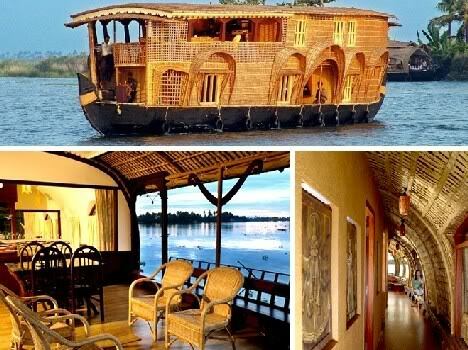 The government-sponsored Kerala Tourism Development Corp. has set out stringent requirements for independent operators of houseboat rentals and charters that provide guests with the utmost in luxury. 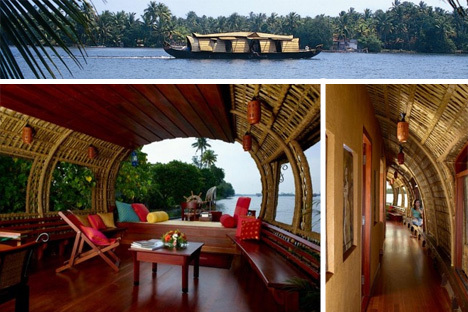 These splendid houseboats of wicker, bamboo and rattan allow a leisurely view of southern India’s splendor with all the perks of subcontinental royalty. From first class to back-of-the bus: how to describe this VERY used houseboat snapped somewhere in the UK by an astonished tourist. 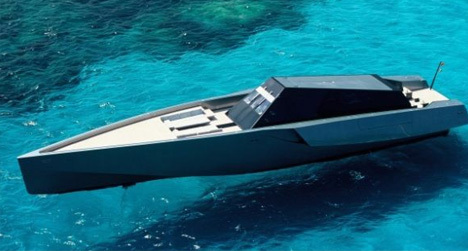 As originally posted, this is a “part boat, part coach, part alien spaceship”. Alien indeed – probably from the Awful Quadrant! Most tourists interested in renting a houseboat will prefer dealing with an established operator with a fleet of standard houseboats in a range of sizes. 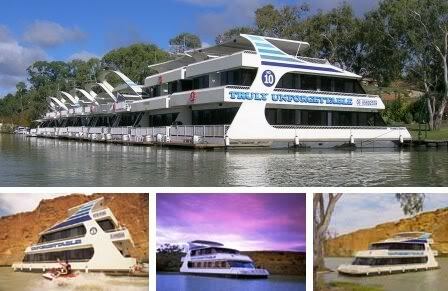 If you’re in Australia, Unforgettable Houseboats fits the bill. The sleek, stylish ships offered by Unforgettable have a starship-like look to them that contrasts with their intended use – sedately cruising down the placid Murray River. From the Outback to back home – ever thought about renting a luxury houseboat in Utah? Yes, Utah, home of the Great Salt Lake and formerly Deseret of the original Mormon pioneers. Not exactly the place one thinks of when houseboating comes to mind – until now. The gorgeous 70-foot houseboat pictured above is one of many, ranging from 44 to 75 feet in length, available for houseboat rental at Utah vacation destinations such as Lake Powell. Imagine visiting Bryce Canyon and Zion National Parks, as well as amazing Monument Valley, just minutes from your luxurious rental houseboat. Sleepover in Seattle? Filmdom’s fave floating digs have made a splash in the real estate market. 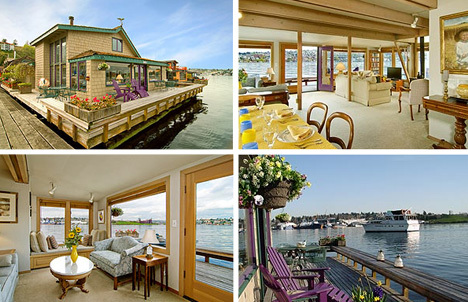 For a mere $2.5 million or so, the one-of-a-kind houseboat featured in the movie Sleepless in Seattle could be some lucky bidder’s new home on the waves. This scene of cinematic sparks between Tom Hanks and Meg Ryan features 4 bedrooms and classic 1990s decor on a 2,720 square foot log float. I’ll have what she’s having! 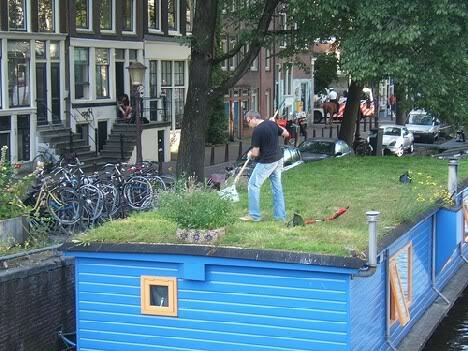 By many accounts Holland is the houseboat capital of the world – over 10,000 woonboten (houseboats) ply centuries-old canals and coastal coves – and though some houseboaters in The Netherlands do take things to the extreme, most follow the design of the above example. Based on tried and tested cargo barges, Dutch houseboats are incredibly stable; this might be due to their heavy concrete hulls. On the subject of concrete, what can be said about the monstrosity above? 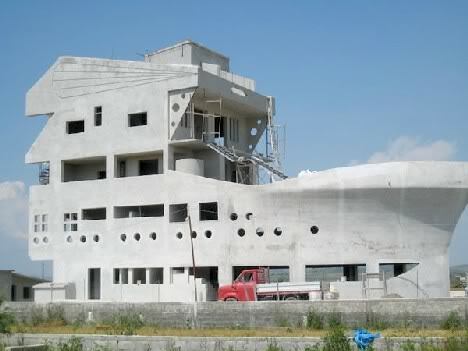 It’s a ship, it’s a building, it’s certainly ugly. 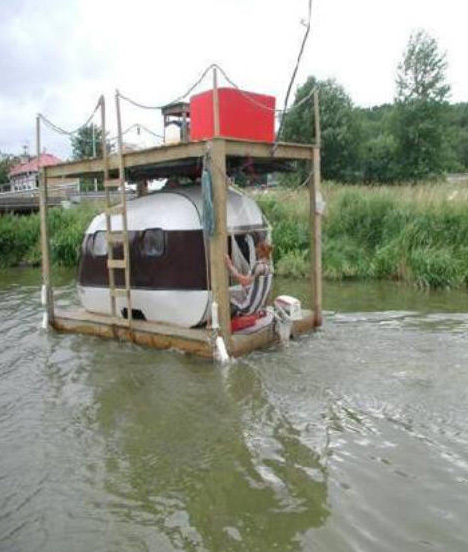 Most times it’s preferred that a houseboat doesn’t sink but in this case an exception can be made. Last and most certainly not least as far as luxury living on the water is concerned, are the spectacular Villa Nackros houseboats made in Sweden by Modern Marine Homes. Available in two sizes (large and larger), these exclusive water villas are designed to be virtually maintenance free and are constructed to the highest environmental standards. The finishing touch? Fire protection is assured through the use of an on board sprinkler system. How Swede it is!